Another day, another batch of spy photos depicting the all-new 2020 Land Rover Defender. 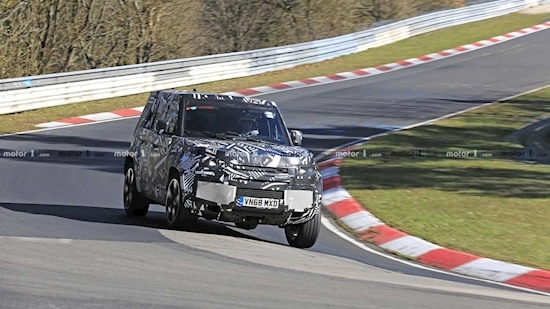 After seeing the boxy SUV testing in winter conditions on several occasions, this time around it has been spied on a rather unusual place – the legendary Nurburgring race track in Germany. While the Defender definitely doesn’t belong there, seeing it undergoing high-speed evaluations still makes sense. Land Rover has already confirmed the new generation of the off-roader will target a broader customer range which means it will have to be just as good on asphalt as it is in the mud. “The one thing I can promise you is that the new Defender will do all that our customers expect of it, without being a copycat of what has gone before. It is a car for the modern world, and that means that it must move the game on if it is to be relevant,” Jaguar Land Rover’s chief marketing officer, Felix Brautigam, commented a few months ago. With that said, it’s not a huge surprise that British test drivers are putting the Defender to its limits on the track. You can clearly see there’s a significant body roll and that the independent suspension is under heavy load on the fast right corner. Still, the SUV looks somewhat safe at high speed. Unfortunately, these new photos don’t reveal more details about the vehicle’s exterior but we’ve already seen a number of prototypes giving us a pretty good idea of what to expect. Obviously, it’s going to be an all-new product but it will retain the boxy overall shape and short front and rear overhangs of its predecessor. Needless to say, the powertrain range will be completely revamped. At its launch, the new Defender will be powered by a 2.0-liter turbodiesel which should be joined by a hybrid motor later during the SUV’s lifecycle. At this point, it’s not clear what engines Land Rover will offer its U.S. customers once the Defender reaches American shores sometime in 2020. Previous spy photos have already confirmed the model will continue to be offered as both long-wheelbase and two-door SWB variants.